The Unified Video Decoder, previously called "Universal Video Decoder", or UVD in short, is the video decoding unit from ATI Technologies to support hardware decode of H.264 and VC-1 video codec standards, and being a part of AVIVO HD technology. The UVD is based on an ATI Xilleon video processor, incorporated into the same die of the GPU and part of the AVIVO HD for hardware decoding videos, along with the Advanced Video Processor (AVP). The UVD, as stated by AMD, handles decoding of H.264/AVC, and VC-1 video codecs almost entirely in hardware. The decoder meets the performance and profile requirements of Blu-ray and HD DVD, decoding H.264 bitstreams up to a bitrate of 40 Mbit/s. It has context-adaptive binary arithmetic coding (CABAC) support and dual-stream decoding support, which would make picture-in-picture possible. Unlike video acceleration blocks in previous generation GPUs, which demanded considerable host-CPU involvement, UVD offloads almost the entire video-decoder process for MPEG-2, VC-1, and H.264. For example, neither ATI Radeon R520 series' AVIVO nor NVidia Geforce 7 series' PureVideo assist front-end bitstream/entropy decompression in VC-1 and H.264 - the host CPU performs this work. In addition to handling VLC/CAVLC/CABAC, frequency transform, pixel prediction and inloop deblocking, UVD also contains an advanced video post-processing block. Post-processing includes denoising, de-interlacing, and scaling/resizing. AMD has also stated that the UVD component being incorporated into the GPU core only occupies 4.7 mm² in area on 65 nm fabrication process node. A variation on UVD, called UVD+, was introduced with the Radeon HD 3000 series. UVD+ support HDCP for higher resolution video streams. But UVD+ was also being marketed as simply UVD. The UVD saw a refresh with the release of the Radeon HD 4800 series products. 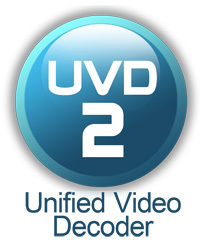 The UVD 2 features full bitstream decoding of H.264/MPEG-4 AVC and VC-1 video streams, and in addition it also supports dual video stream decoding and Picture-in-Picture mode. This makes UVD2 full BD-Live compliant. The UVD 2.2 features a re-designed local memory interface and enhances the compatibility with MPEG2/H.264/VC-1 videos. However, it was marketed under the same alias as "UVD 2" as the "special core-logic, available in RV770 and RV730 series of GPUs, for hardware decoding of MPEG2, H.264 and VC-1 video with dual-stream decoding". The nature of UVD 2.2 being an incremental update to the UVD 2 can be accounted for this move.